Sew! Can! Kenna: A finish!! In my "day job" I'm a teacher. And I teach home ec (hence the comments about beginning sewing). 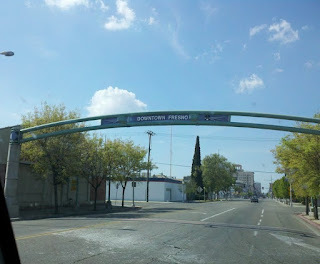 This week is the state wide competition in lovely (insert dripping sarcasm here) downtown Fresno. Fresno you say? IMHO it's the armpit of California. Really. I live in Long Beach. I have lived in the "hood" at various times in my life. I have never been as nervous as I was at walmart in South Fresno on Sat night. Sheesh. There were more gangbangers, tweakers and potheads in one place than at a snoop dogg concert. Anyway, I brought my sewing machine and a few UFO's to work on at the conference....and I actually FINISHED a quilt. A FINISH! I'm quite proud of myself. This UFO was a panel quilt that someone gave me that was sandwiched and ready to be free motion quilted. Today I sat down while the students were in a general session and I quilted. I had hideous tension issues that resulted in me "frogging" the quilt a little bit "rippit, rippit" and requilting, but alas, it's done! Then I did a fold over binding. Hummm. Not sure I like that one. Alas, a finish is something! :) And it's cute. (I pinned it to the hotel valance to take this picture.